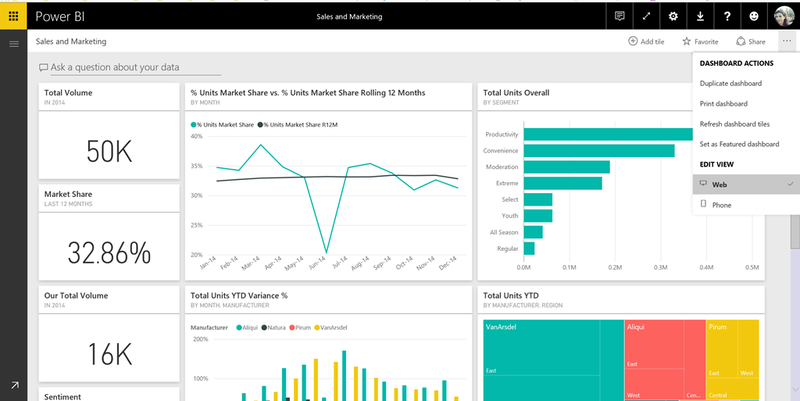 For a while now, Power BI Mobile has enabled you to easily view dashboards on your phone. While most of you have been satisfied with this “turnkey” implementation, we've heard some of you asking for more control over the dashboard layout and appearance on your phone. With this update you can specifically tailor a portrait phone view of your existing dashboard as part of the dashboard authoring experience. Once you finish creating your dashboard in the Power BI service, you can use the dashboard settings to optimize how you view it on your phone. Permissions to change the phone view are only available to dashboard owners. Changing the default phone view will not affect the web, tablet, or phone landscape views of that dashboard. Changes will only be applied to the dashboard when viewing it on the phone in portrait mode. In the phone view editor, you can unpin tiles, resize and re-order them as you’d like. As you edit the phone-optimized view, your dashboard viewers will immediately get the updated experience on their iPhones, Android, and Windows phones. If you want to start over, you can reset the phone view to default and start again. Resizing visuals while maintaining sharpness can be tricky, so starting with card tiles we have optimized the tile to fit the smaller layout. Over the next little while we’ll be working incrementally to optimize additional visuals to suit small viewports. Take a look at this video, and go make your own phone-optimized dashboard! Learn more about Optimizing mobile dashboards in our documentation. We think you'll love this new feature! Let us know at the Power BI community.